The first computer screen Robo must use. 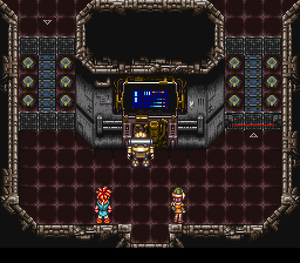 You'll need to leave Marle or Lucca at Proto Dome to accompany Crono and Robo. Marle provides the Aura technique, which allows more mobile healing, while Lucca can attack additional targets. Interact with the computer screen, Robo will disable the security laser so you can use the conveyor belt on the right, however you'll be forced to fight an Acid. Just use slash or some non-physical technique to kill it. Three security robots patrol the front hallway and they will start moving if you get too close to them. Whether you've dealt with them or not, you can take the left or the right passage to the lab or the factory proper (this area is split into two main areas). 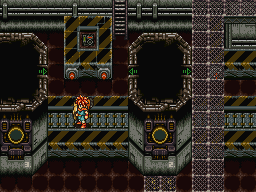 If you want experience and a new sword for Crono, head into the factory first (to the right). If you are trying to reach the secret while minimizing Crono's level, skip the factory and head directly to the lab (to the left). Now you must fight 3x in series. On the factory side, the goal is to search the room for chests. The first one is hidden in a passageway just to the left (head down, left, then back up and climb the little ladder through the door). You'll find the Mid EtherMid EtherMid-EtherMid-EtherMid-EtherMid-Ether in the top right corner (the room is 'L' shaped). Climb down the left ladder and follow the path all the way to the left where you can grab the Robin BowRobin BowBandit's BowBandit's BowBandit's BowBandit's Bow. Head back, then take the right ladder down to where the room is (but do not go in it). Your goal will be to cross over it to the left, without bumping into any of the robots. If you touch a robot you'll have to go through a long series of fights before you get back where you started. It's easiest to wait until a group of two robots has gone by, then run as fast as you can until you reach an alcove. The second alcove has an Ether in a chest. Note that you'll probably have a close call when running on the conveyor belt. Keep moving all the way to the end and then head south to enter a new room. As you enter you'll be forced to fight four Bugs. Afterwards, climb the ladder and head through the door into the main conveyor belt room. Cross the walkway and head to the far right corner for a Mid TonicMid TonicMid-PotionMid-PotionMid-PotionMid-Potion. Go through the right door then grab the two chests: you'll get 400GP and another Mid EtherMid EtherMid-EtherMid-EtherMid-EtherMid-Ether. Interact with the computer to learn the two codes which control the crane, , and . After you end the dialogue, the two robots that were stored in the wall will burst out, and then criss-cross about the room in a mirrored fashion. Wait until a gap opens, then run down and out unless you wish to fight them. Head into the left door to reach the control panel for the crane (that claw thing suspended above the conveyor belt). Two Proto 3sProto 3sVersion 3.0sVersion 3.0sVersion 3.0sVersion 3.0s will be patrolling, but you can sneak by if you're patient. If you fight them you'll also have to fight two Debuggers. Grab the Shelter and another Ether before heading south to the control panel. Enter the codes you learned (one pair at a time) to move the barrels out of the way. This will open up a path to a new area and back to the start so you won't have to repeat the conveyor belt sequence. Exit back through the room (avoiding the Proto 3sProto 3sVersion 3.0sVersion 3.0sVersion 3.0sVersion 3.0s if you wish) and then head down the ladder to the left. Run to the left and go through the door to the north. Pick up the Bolt SwordBolt SwordThunder BladeThunder BladeThunder BladeThunder Blade for Crono, then use the computer to learn the security password ZABIE. Go back to the elevator (just head right following the conveyor belt and climb the ladder) and head out. Go down the other elevator to reach the lab. In the lab, you can save if you'd like but head north and fight the Acid and the two AlkalinesAlkalinesAlkalisAlkalisAlkalisAlkalis (both are resistant to physical damage). Grab the Shelter, then activate the computer to open the hatch to the next level. After opening the hatch go to the bottom-right corner in the room to find a ladder leading to the room to turn off the lasers. Go down the hatch, head west across this first room where you'll be forced to fight two AlkalinesAlkalinesAlkalisAlkalisAlkalisAlkalis, one at a time. Loop around south into the center room. Grab the Titan VestTitan VestTitanium VestTitanium VestTitanium VestTitanium Vest on the left side of the room and the Hammer Arm on the right, then equip the vest on Crono and the arm on Robo. Use the computer to the north to disable the lasers around the lab. You'll have to fight three Acids and two AlkalinesAlkalinesAlkalisAlkalisAlkalisAlkalis at the same time for a semi-difficult, MP draining fight. Use AOE techniques (Slash or dual techs work well). When you're ready (you could save if you like), head down a level either by using the hatch in the center room or the elevator (it moves up and down). Head north in the long passage, grab the Plasma Gun and then use the computer that requires the ZABIE password (press , , , after the prompt). Regardless of whether or not you completed the factory portion of the ruins, you can just enter in the code " - - - " to skip to the last part of the factory. Head north and use the button on the wall. An alarm will sound and you'll need to escape the factory before it goes haywire. Head south, where you'll almost get stuck in the hallway, then head up the ladder because the elevator has been shut off. You'll eventually come to the long walkway with robots embedded in the wall. Upon entering, Robo's old buddies will come out, beat him up and then throw him into a wall compartment. Crono and his human partner will need to take on all six R SeriesR SeriesR-SeriesR-SeriesR-SeriesR-Series robots alone. Robo Punch: a punching attack which does about 25-30 physical damage to one person. Robo Wired Punch: a ranged punch which does about 15 physical damage to one person. Robo Laser / Shadow: a linear attack that deals shadow damage. Robo Pitch: if at least two of the R Series are destroyed, a counter-attack which juggles one character around between two of the R Series, before throwing them into your other party member, which does about 25 physical damage to both. Robo Explosion: if one of the R Series remains, an explosive counter-attack that hits both party members for about 50 damage. This can sometimes be a difficult fight because almost all of the robots attack in a row, mostly on the same party member. Just concentrate on one of them at a time. Using Crono's Cyclone ability will quicken the battle; two uses on each group of three will work. To avoid any counter attacks, hit the front and back rows of robots with one Cyclone each, then finish them off with the same attack. If you have Lucca, use Flame Toss or dual tech Flame Whirl with Crono and have her use Mid Tonics if necessary. If you're using Marle, have her use Aura to heal while Crono performs the attacks. It shouldn't take too long to defeat them all, as long as you concentrate on one of them (or three if you follow the Cyclone advice) at a time. If you attack the robots when at least three of them are destroyed, they begin to counter with a special attack that hits both characters. When only one robot is left, the counter attack becomes more powerful. After the battle you'll pull Robo out of the wall and drag him back to the Proto Dome. 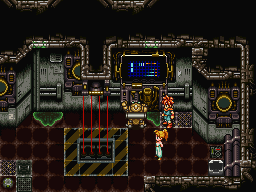 Marle and Crono will sleep as Lucca pieces Robo back together. After his revival, Robo will want to join the crew in hopes of saving the planet. Together, the group heads into another time gate. This page was last edited on 14 April 2019, at 00:50.